More than 30 people, many from interstate, took part in this introductory course. Five important courses focusing on major issues facing the water resources management sector will complete ICE WaRM’s public short course programme for 2012. The 7th Climate Change Adaptation course will be staged in Adelaide on 26 and 27 November. It will be led by presenters Peter Waterman and Greg Laves from USC and Graham Green from the South Australian Department of Environment, Water and Natural Resources. 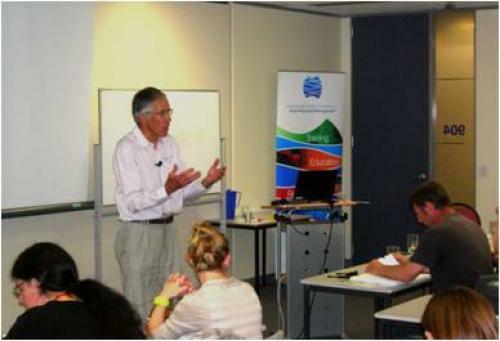 And a three-day Water in Coal Mines course will be held in Newcastle on 28, 29 and 30 November. The programme includes a wide range of specialist presenters, chaired by Noel Merrick and including Stuart Brown, Wendy McLean, John Doyle, Peter Dundon, Winton Gale, Ken Mills, Lindsay Gilbert, George Gates, Rob O’Neill, Steve Perrens, John Ross, Greg Tarrant, Arthur Waddington and Bill Ziegler. As part of the new alliance between ICE WaRM and eWater, the organisations will jointly offer specialist national short courses supporting eWater’s modelling software.